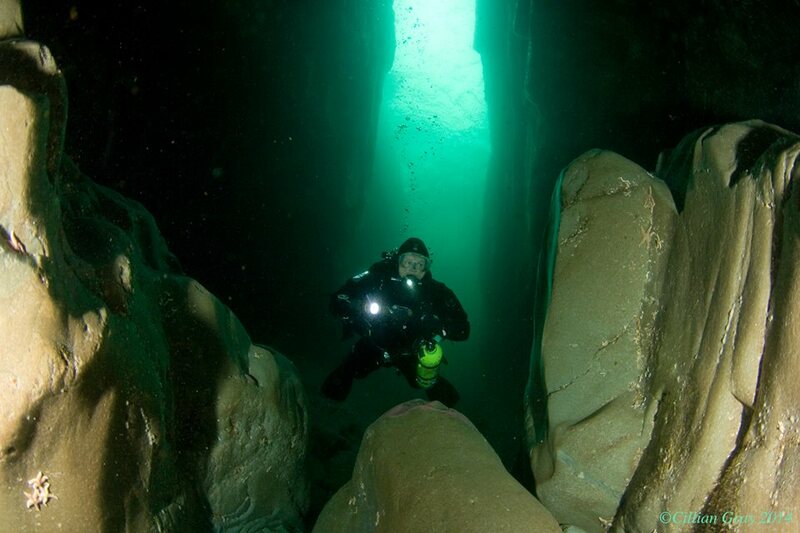 Scubadive West Dive Blog – Bringing you all the diving news from the West of Ireland. For our 2018 Test Event, we are delighted to have the guys from SUUNTO Diving UK visiting again with their full line up of wrist mounted dive computers, dive lights and dive wings available for you to try out on a test dives. With all the popular models available, from the brand new D4f freediving Computer and the great value ZOOP NOVO to the High Spec. Hel O2. It is a great opportunity to test dive the whole SUUNTO range and choose the one that suits you. Many people buy their own unit at these weekends. First let’s look at the new products! A brand new Dive computer for freediving, snorkeling and spearfishing. A new compact dive computer with a clear color screen and customizable features. The SUUNTO Eon Steel is very popular, with its stunningly bright colourful display, built in compass and air integration. Also the very popular Suunto DX and D6I watch computers. will be available to try out. Whether you’re just starting out on your diving journey or looking to explore new underwater adventures, Suunto Zoop Novo has everything you need. With your easy to understand key dive data available at a glance on the big, super-bright backlit display, all you need to do is suit up, dive down, and enjoy the view. This simple to use dive computer includes full decompression capabilities, five dive modes (Air, Nitrox, Gauge, Free and Off) and straight-forward, menu-based Suunto user interface. Available in three colour choices, Blue, Lime Green or Black. Price €299. €539. 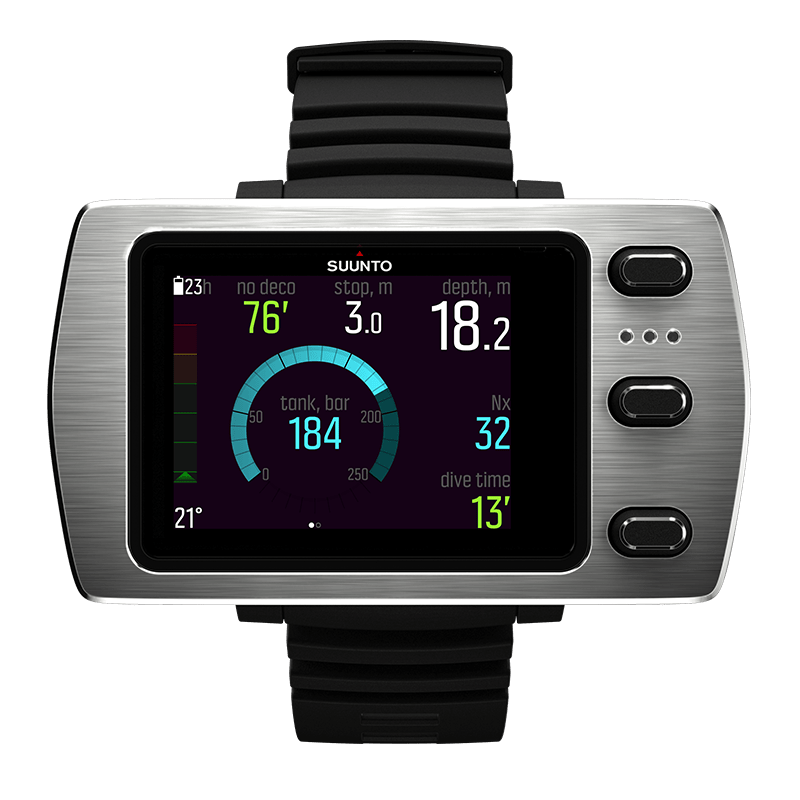 It has the new dot matrix, backlit display, gas switching for up to 3 gasses and is compatible with the SUUNTO air integrated transmitter. The Finn Sub FLY 13D is ideal for diving with a single cylinder. During our demo event you will be able to test dive these units with anything from a 7 Litre 300 bar cylinder through to 15 litre dual outlet cylinder, they are very comfortable and versatile! FLY 25D. For Twin 18 Litre cylinders! For the more advanced divers we have everything up to the fly 25D. Ideal for the twin cylinder technical diver with deep intentions. We will have some set up with twin cylinders for you to try. The full range of Finn Lights will be available to test dive, from the 750 Short to the 3000 Long. 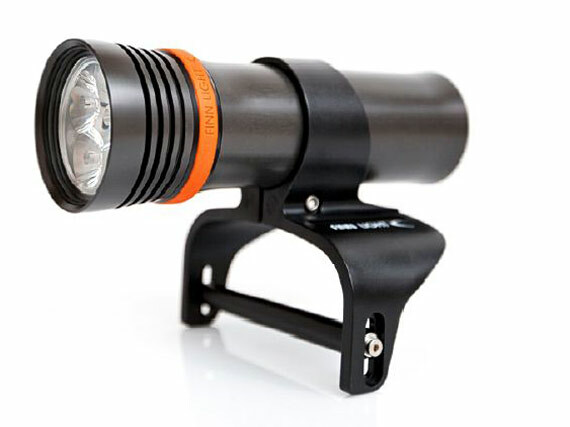 These dive lights are beautifully made, easy to use and deliver excellent quality light. We will have great offers available all weekend and spot prizes too! We are Irish agents for all of the SUUNTO, FINNSUB AND FINNFLY products and carry a good range in stock. Contact us now if you would like further information and to book your place at the SUUNTO Equipment Test Weekend, 21st & 22nd April 2018. What is a Photo Rally? admin March 16, 2017 March 16, 2017 No Comments on What is a Photo Rally? The Annual Photo Rally at Scubadive West is great opportunity to improve your underwater photography skills and meet like minded divers participating in a fun competition. Scubadive West Photo Rally 12th to 14th May 2017. Wide Angle photography on boat dives. The competition is free to enter and only photos taken during the event can be submitted. Scubadive West offer a special package for registered participants, unlimited shore diving, one boat dive and all of your air fills during the event for just €45 per person! There are three categories: Wide Angle Photography, Macro Photography and Compact Camera Photography. Our Shore Dive is bursting with marine life and offers unlimited opportunities for Macro photography. Scallops, Spider Crabs, Hermit Crabs, Pollock, Wrasse and all manner of their photo taken! Spring has arrived in Connemara after a calm and mild Winter! We have been immersed in some great boat diving over recent weekends. See the images on our facebook and Instagram pages. Our ever popular Island Dive Safaris, Adventure Day Trips and local Boat Dives are booking now. Visit the Scubadive West Calendar and Shane Gray’s website for all your 2017 dates and to book in with us. Some more dates for your diary include; Dive Ireland on 4th & 5th March and Scubadive West Photo Rally 12th to 14th May. The Dive Ireland Show returns to Hodson Bay Hotel, Athlone this year. It is an excellent venue – an ideal opportunity to meet like minded divers, attend fascinating talks and see the great diving on offer around Ireland. Come and say hello to us at Stand C9 in the Clonmacnoise Suite, the same location as last year. We would love to chat with you about diving in Connemara and El Hierro. The Raffle of the Year! Scubadive West and ‘Shane Gray- Diving & Walking Holidays’ have teamed up to bring you the Raffle of the year! Enter this RAFFLE at our Stand over the weekend. These are the prizes! First Prize is an El Hierro Dive Holiday for Two with Shane Gray Diving & Walking Holidays! This Diving Holiday for two divers, to the magical Island of El Hierro includes all transfers, ferry crossings, diving and self catering accommodation included, ex flights to Tenerife. 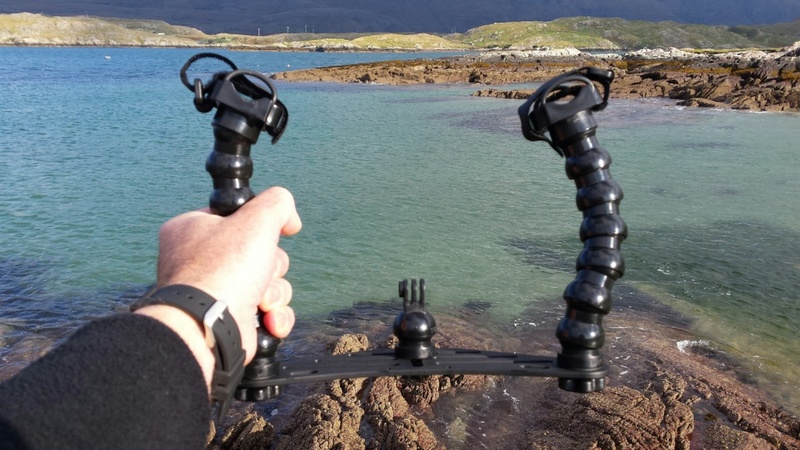 (value €650 per diver), so a total prize worth €1,300!. 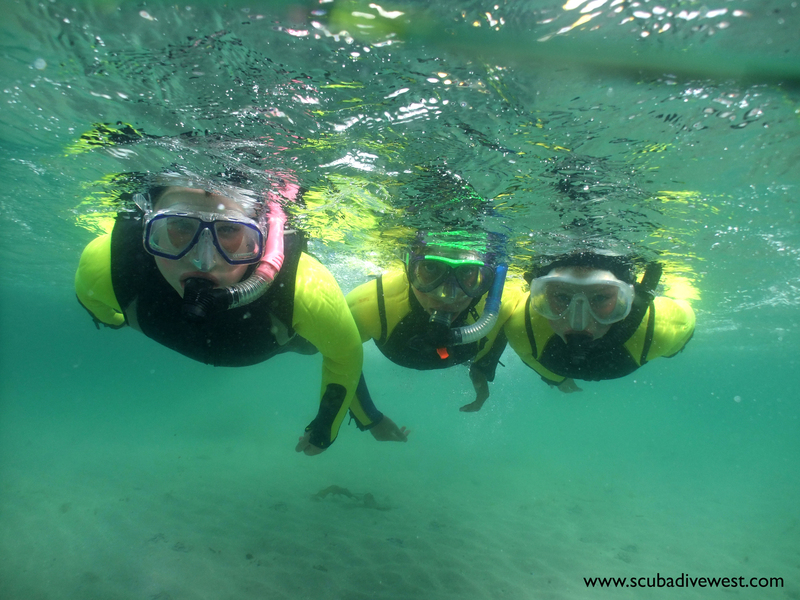 Second Prize is a Diving Weekend for Two with Scubadive West, including a boat diving package of 4 dives and 3 airfills (value €130 each), AND two nights B&B in the luxurious Maol Reidh Hotel with one evening meal (value €105 each) .. for TWO divers, so a total prize worth €470!. Third Prize is your very own copy of ‘Jewellery Box’ the fabulous photo book of stunning images by renowned Photographer Daragh Muldowney. Diving with Scubadive West read more>> . Why not get away for a great Boat Diving weekend with Scubadive West this Spring, four boat dives and three air fills €130 with our discount code SDWSPRING2107. Treat yourself to luxury accommodation and delicious food at Maol Reidh Hotel, two nights B&B and one dinner for €105. 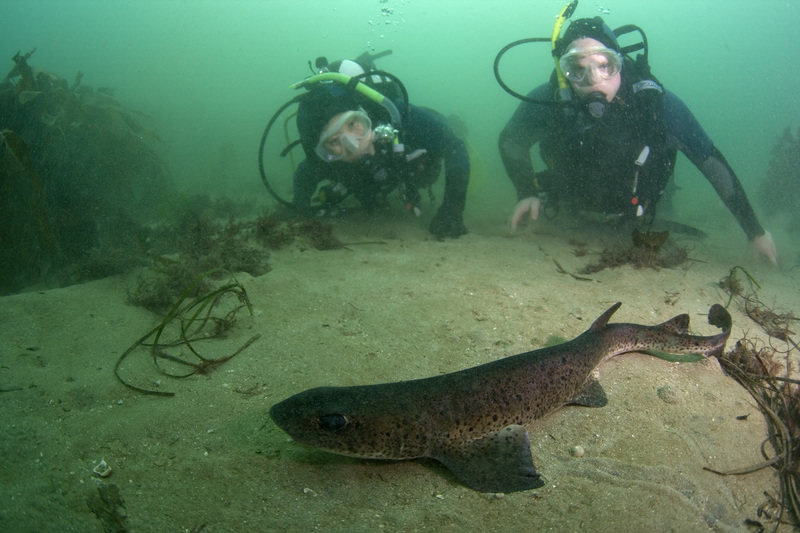 Our Photo Rally Weekend takes place from 12th to 14th May at Scubadive West. It is a great opportunity to develop your underwater photography skills in a fun competition. There are great prizes on offer too! A local pod of dolphins are regular visitors to Killary Fjord, we often see them from our dive boat and occasionally the curious ones will come over and say hello. Your Christmas Gift idea is sorted! admin December 16, 2016 February 4, 2017 No Comments on Your Christmas Gift idea is sorted! At last a lightweight camera tray! 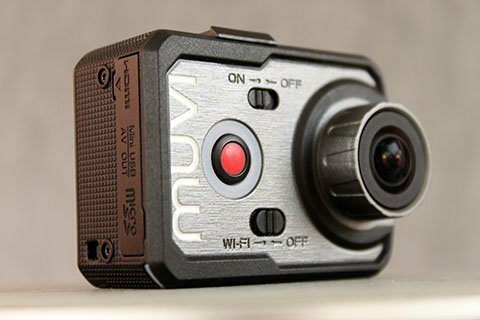 ideal for your MUVI camera, your GoPro or any compact camera. 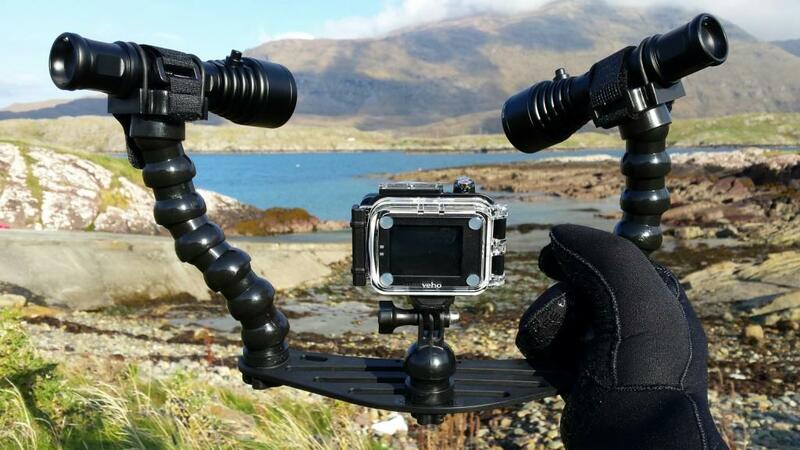 Camera tray complete with two adjustable arms and two torch mounts, €99. In stock and available from Scubadive West. Tray as above with one arm and torch mount…€65 ! So you’ve got your action camera, maybe it’s a super MUVI camera with waterproof housing rated to 100 metres, maybe it’s another brand, now you want to get high quality footage deeper than 5 metres and the ambient light is not enough. Introducing the D500V, a compact but powerful 700 lumens video light with 3 output settings, easily managed by push button. 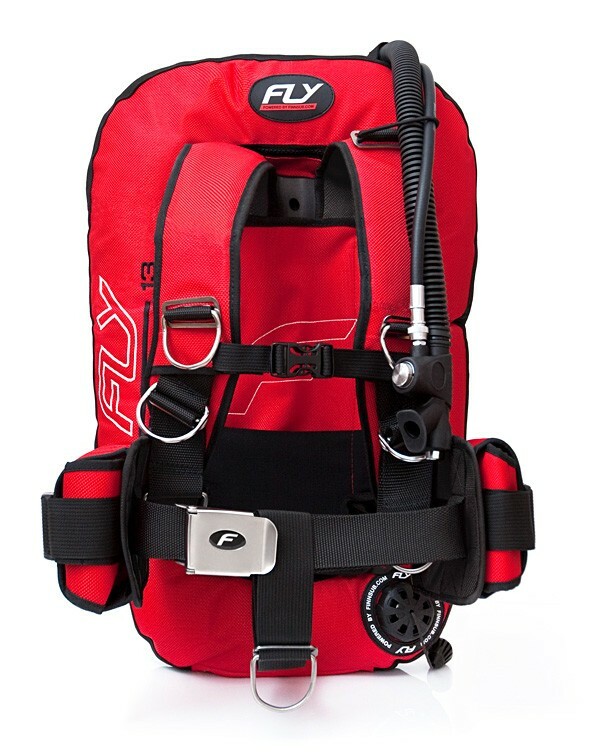 Available in stock at Scubadive West €120. Call +353 (0)95 43922 or email us info@scubadivewest.com to order yours now. Mount your D500V Video Light and you can capture all the natural colours underwater! The only Christmas Jumper you’ll ever need! Premium quality mens and ladies ‘Dryblend’ fleece hoodies available in a range of sizes and colours. Ladies and Mens Hoodies available in Extra Small, Small, Medium, Large and Extra Large sizes. 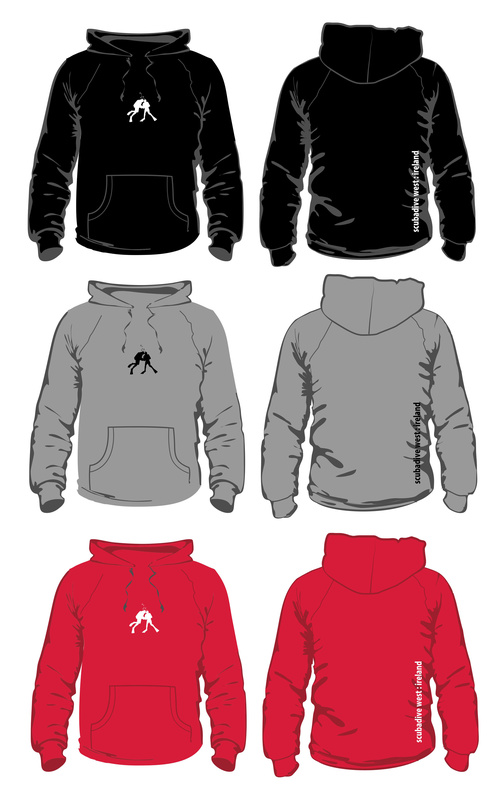 Colour options, Red, Pale Grey and Black. and now Navy blue also! Hoodies €45 Special offer €40. Call us now at +353 (0)95 43922 or email info@scubadivewest.com to place buy. Lots of extras included, all in a protective case. The K2NPNG camera records in full HD 1080p @60FPS, with up to 3 hours of recording time. It comes complete with it’s own waterproof case, rated to 100m depth! The K2NPNG camera records in full HD 1080p @60FPS, with up to 3 hours of recording time. It comes complete with it’s own waterproof case, rated to 100m depth! plus lots of accesories, all in a robust carry case. Call us at +353 (0)95 43922 or email info@scubadivewest.com for further information and to book a test dive! Discover Snorkelling Gift Vouchers €30 ea. Give the gift of a life changing experience. Discover Scuba Diving Vouchers available for half-day €89, or full day €140. Participants may redeem their vouchers anytime within 12 months of issue. Scubadive West Gift Vouchers are available for any amount and activity! Boat diving, Shore Diving, Adventure Day Trips, Island Dive Safaris…. Dive Trips on the Wild Atlantic Way, all available as Gift Vouchers! Call+353 (0)95 43922 or email us info@scubadivewest.com to buy now. 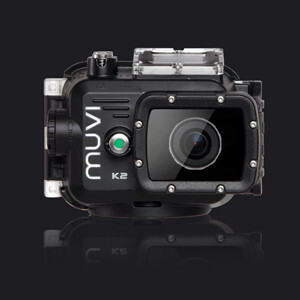 We have captured great video footage on our Discover Scubadiving programmes, thanks to the MUVI Cameras that we sell here at Scubadive West. Our partners Extreme Xperts have set us up with all of their great products and some demo units too! The camera is compact and can easily fit in a pocket, or hang from your BCD on a lanyard if you just want to use it casually. (For serious footage at depth, we have great options for adding video lights!) We find it easy to use even with diving gloves on – thanks to the large buttons. The small LCD display on the top of the camera is very informative as it clearly displays whether you are in video or still photo mode, it clearly shows when you are recording, and even has a battery status icons. We love the large, full colour LCD screen on the back of the camera, as you can clearly see what you are recording so you don’t miss any of the action. This screen is detachable, making the camera very versatile for different activities. Call us at+353 (0)95 43922 or email info@scubadivewest.com for further information and to book a test dive! admin October 14, 2016 February 4, 2017 No Comments on Take the Master Scuba Diver Challenge! A great PADI Video promoting the Master Scuba Diver Challenge. We were delighted to host the PADI Crew here at Scubadive West to film the footage! For our 2016 Test Event, we are delighted to have the guys from SUUNTO Diving UK visiting again with their full line up of wrist mounted dive computers, dive lights and dive wings available for you to try out on a test dives. With all the popular models available, from the great value ZOOP to the High Spec. Hel O2. It is a great opportunity to test dive the whole SUUNTO range and choose the one that suits you. Many people buy their own unit at these weekends. Fantastic diving at The Bills Rocks, testing out the SUUNTO Vyper Air. A very nice computer with air integration, gas switching and a tidy digital compass built in too! Contact us now if you would like further information and to book your place at the SUUNTO Equipment Test Weekend, 21st & 22nd May 2016. Photo Rally 2016 … and the winners are …. admin April 22, 2016 February 4, 2017 No Comments on Photo Rally 2016 … and the winners are …. Our Photo Rally 2016 was a great success, with excellent visibility, super weather and most importantly great fun! Underwater photographers competed in 3 categories, namely Macro, Wide angle and Compact Camera. This was strictly an amatuer competition with the emphasis on fun and improving skills. Competitors snapped images of the stunning flora and fauna on boat dives and shore dives here at Scubadive West in Connemara. Well done Ronan for capturing this stunning image of a Stalked jellyfish (Stauromedusae) on a blade of sea grass. Photo taken while shore diving on our sea grass beds, (a treasure trove of miniature species!) Ronan rotated the photograph for dramatic effect. We think it looks like fireworks going off! Ronan wins the €150 Voucher for O’Three equipment at Scubadive West. Ray took this great photo of a Nudibranch while diving on the Julia T wreck with us on Saturday. He competed on Friday and Saturday, but had to Jet away to work for Sunday, so his prize will be winging it’s way to him this week. Well done Ray, winning the delicious prize of Dinner for Two at the new White Strand Restaurant (at Maol Reidh Hotel )…and… B&B for two at the luxurious Maol Reidh Hotel! Thanks to Robbie and Aoife,- White Strand Restaurant, and thanks to Jack and Monica – Maol Reidh Hotel for these fantastic prizes! The perfect apres dive experience! Congratulations to Nicky on catching this extreme close up of a Ballan Wrasse. Nicky wins the super accurate SUUNTO SK8 wrist compass complete with bunji mount. Thanks to SUUNTO Diving UK for this great prize. Congratulations to Sarah Tallon on this well lit and well composed photograph of an edible crab looking out from under a large ‘Boring Sponge’. The contrast between the yellow sponge and the background gives great depth of field. Sarah wins a set of toasty warm O’Three PPB+ thermals at Scubadive West. Perfect for those long exposures! Well done Dan McAuley! A great shot of one of the large overhangs at Bird Rock – a favourite dive site for photographers. A Sea Urchin in the foreground and a diver well framed in the background. Dan wins Dinner for two at Paddy Coyne’s Bar and Restaurant, Tully Cross. Well done Sarah on capturing this beautiful gully at Doonee Beacon. Sarah wins the €50 Voucher for MUVI equipment at Scubadive West, thanks to Tony at Extreme Xperts for sponsoring this prize. Congratulations Mariusz Tyburski on snapping a shot of this Parchment Worm – before it retracted into is tube. Mariusz wins the super bright Orca Torch D510 Dive light at Scubadive West, thanks to Tony at Extreme Xperts for sponsoring this prize. D510 Dive Light from Extreme Xperts. Well done Lisa Moran on capturing the clear water and colourful kelp reef — while freediving- ! Lisa competed in snorkelling equipment, sans scuba, and snapped some great shots. Lisa wins Dinner for two at Baywatch Guesthouse, Tully Cross. Well done to Mark Flahery our youngest competitor (at just 12 years old!) – on snapping this colourful Sea Urchin. while shore diving here on Saturday. Mark wins the SUUNTO Rucksack full of goodies. He will be too cool for school with this branded rucksack, hoodie buff and lots of other treats inside! Thank you all for competing! We had super diving conditions for the Photo Rally and the great weather continues, with High Pressure, Blue Skies and air temperatures of 17 Degrees Celcuis – not bad for April. If you missed the Photo Rally this time, don’t despair we have diving here all Summer long! Call 095 43922 or email info@scubadivewest.com to book in. Join us for our Annual Photo Rally. Scubadive West Photo Rally, 12th to 15th May 2017. Every year we see new talent emerging at our Photo Rally. The 3 day event is designed to encourage amateur underwater photographers to compete in up to three categories, namely Wide Angle, Macro and Compact Camera category. Wide angle Photo by Sarah Tallon, taken at the Bills Rocks. The most stunning Wide angle photographs often include a well lit, well focussed wall or marine life in the foreground and a diver in the background. Shooting photographs slightly upwards will help to keep the background bright. Macro photographs are close up and clear, with one marine animal or a small cluster of plants or animals as the center of focus. The Compact Camera category is for divers with a simple compact camera in a housing, or a GoPro, MUVI, GITUP or similar action camera. John Dory, The coolest looking fish on the reef. Composition is important so take a Macro type photo or a Wide angle type photo. In very shallow water with good visibility no additional light is necessary, so shoot away! Hermit crabs, scallop, pipe fish, little cuttle, plaice and dogfish all make willing subjects. For deeper water, use a strobe or video light to illuminate the foreground of a Wide angle photo. Also you can adjust the White balance – most compact cameras and the GITUP action camera have this function. A colour filter can be placed over the lens of basic action cameras to get great results. Using the camera’s internal flash can cause ‘backscatter’ – illumination of particles in the water, spoiling the photo. A strobe is an excellent option to use with a compact camera, as illuminating the subject from the side or above prevents backscatter and gives a nice clear image. Action cameras don’t usually have an internal flash or the ability to fire a strobe. So how do you illuminate your subject with natural white light? 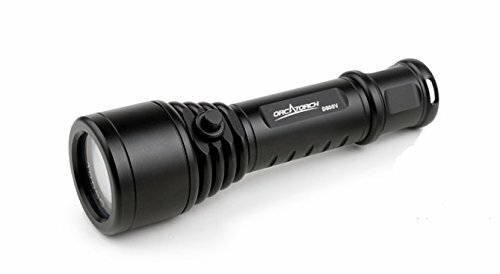 Well a normal dive torch is designed to throw a narrow beam of light as far as possible, so they will create a ‘hotspot’, or very bright area at the centre of your photo, hence they are not ideal for underwater photography. A video light, however, throws a wide beam of even light with no hotspot. Video lights work very well with action cameras that don’t have a flash or the ability to fire a strobe. Modern, inexpensive video lights are available now and have 3 output settings, so you can shoot on low, medium or high output. For the best results – take a shot on each of the three settings and see what works! Photo by Pawel Burzynski, 3rd October 2015 at Scubadive West. for more details and to Register. It is going to be a great fun diving weekend! Only photos taken during the Photo Rally at Scubadive West may be submitted. The winners will be announced at our Prize Giving Ceremony on Sunday 17th April at 4pm. We have a very special package available for registered participants; Three days of Unlimited Shore Diving, Air Fills and one Boat Dive during the Photo Rally for just €45. Additional boat dives at just €35. Also available 4 boat dives with 3 air fills for just €130, for the ardent boat divers! Please note that this is an amateur photo competition. Anyone who currently sells or has in the past sold their photos is not eligible to enter. Enforcement of this condition is strictly at the discretion of the competition organisers. 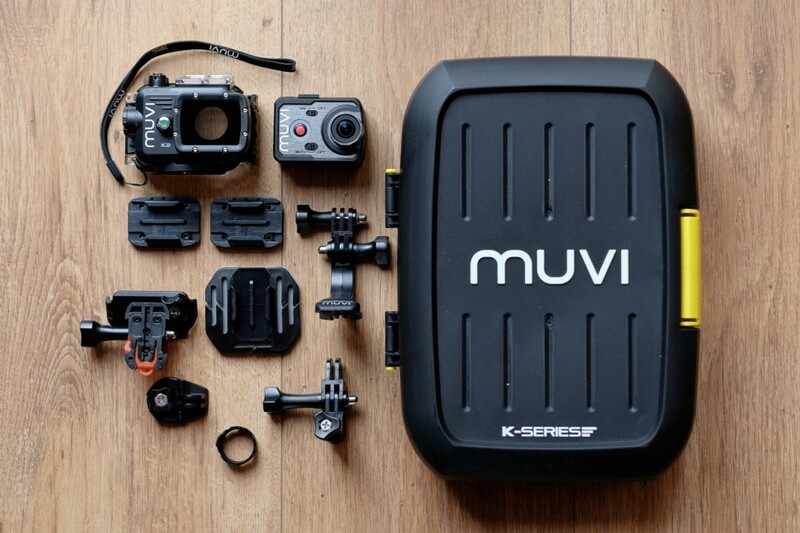 3rd Prize: €50 Voucher for MUVI Camera equipment. 2nd prize: Dinner for Two at Paddy Coynes Bar & Restaurant. 3rd Prize: Suunto SK8 compass, complete with Bunji Mount. 2nd prize: Dinner for 2 at Baywatch Guest House. 3rd Prize: SUUNTO Rucksack full of goodies. Prizes may vary due to stock available from suppliers. There will be a FREE RAFFLE for all registered participants with spot prizes and great offers available all weekend! Scubadive West thanks all of our generous sponsors for their contribution to this competition. Scubadive West’s 2016 Photography Competition will culminate in a prize-giving ceremony at 4pm in Scubadive West. followed by an informal gathering in the quaint village of Tully Cross. Local accommodation listings available on our website too.